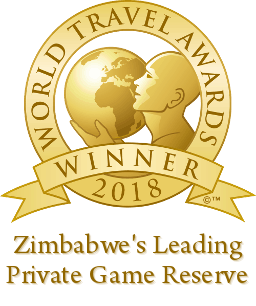 The picturesque Serenity Lodge is set 1.5km outside of the main camp, inside the game park itself; offering groups an unrivalled level of privacy and incredible wildlife viewing opportunities, from the comfort of the lodge’s shaded porches. Up to twelve guests can be accommodated in the lodge’s four spacious bedrooms. A fully-equipped kitchen gives guests the option of a self-catering stay, although guests may also choose to dine a la carte in the main camp dining area for any or all meals. The lodge features a spacious and comfortable double-volume lounge/ dining area, with a large fireplace; perfect for the colder winter months. Beautifully-manicured shaded lawns span from the lodge’s twin porches into the bush, where antelope, zebra and smaller game roam freely.